Meet Gia Heflin, an Army Reservist, single mother, master’s student, and Raintree Athletic Club’s 2017 scholarship winner. As the recipient of the 2017 RAC Scholarship, Gia won 12 personal training sessions, 7 nutrition sessions and a detailed weekly meal plan, starting measurements, and guidance on different exercises as well as motivation here at the club. You can catch Gia working with her personal trainer Niki Veldman, consulting with Nutritionist Ashley Talebi, and crushing it in various group fitness classes throughout the week, including BodyJAM, BodyPUMP & BodyCOMBAT. Trainer Niki Veldman worked with Gia once a week to help her reach self set goals. “She wanted to pass her PT physical tests which included push-ups, sit-ups, a timed 2 mile run in addition to body weight and measurement requirements. She had no issue making the minimum requirements for the push-ups and sit-ups, however, needed to cut several minutes off her 2 mile time, as well as decrease some body measurements. Our focus was improving aerobic capacity for running and overall strength training. Flash back to our first session, Gia had to walk some in order to complete a timed 1 mile run… fast forward to our most recent session, and she could run 3 miles without walking,” says Trainer Niki. On June 30th Gia passed all of her PT physical testing requirements! 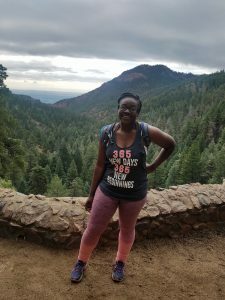 She continues to push herself and set new goals including maintaining a training schedule (about 5/6 days a week) as well as running the Fall Equinox Half Marathon in September. That’s 13.1 miles of pure endurance — how’s that for inspiration? Since starting her scholarship fitness journey in January, Gia has reached personal and physical milestones alike; but most important gaining her confidence inside and out of the gym. We are extremely proud of this scholarship recipient and hope that her story can be an inspiration to you.